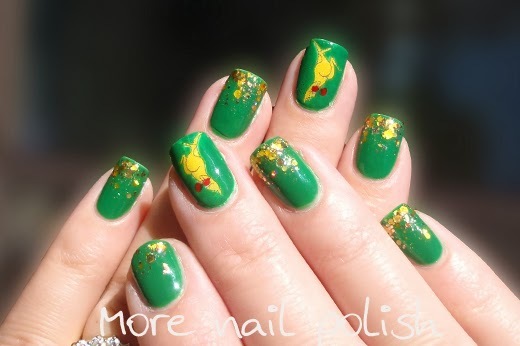 Day 28 of the 31 Day Challenge calls on us to create flag nails. I've already done my fair share of Australian flags and I was considering doing the flag for Canberra, or more accurately, the Australia Capital Territory flag. Except that it's rather dull and uninspiring to create on my nails. So I did what I always do when I'm stuck for ideas, I googled! I came across the Flags Australia site, which goes into detail about each of the State and Territory flags and other historical flags. It was on this page that I spotted our Boxing Kangaroo flag. When I read about the history of the Boxing Kangaroo flag I knew I had picked my winner. You see, it turns out that in 1983, when the yacht Australia II won the America's Cup, the promotional mascot for the challenge was the Boxing Kangaroo - a cartoon of a kangaroo wearing boxing gloves. This irreverent symbol was placed upon a green flag. The copyright to the image was purchased by the Australian Olympic Committee and it continues to be used in sports promotions and has become synonymous with Australian achievements in many fields. 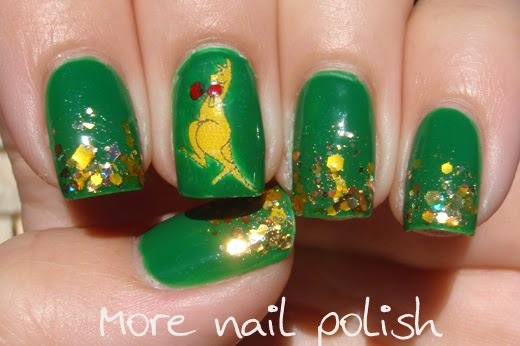 The reason I instantly knew I had to paint these nails was because the day I actually painted these on was the 30th anniversary of Australia II winning the America's Cup. It was also the day the Kiwis choked and lost it to the Americans after having held and 8-1 lead over them. I'll just point out too, that skipper of the winning American yacht was an Aussie, along with another seven Australians. Apparently only two of the crew were Americans. Anyway, I've faffed on long enough about that story, lets look at the nails. I printed the boxing kangaroo using temporary tattoo paper, but I knew it was never going to show up over the green, so I put down a white base and stuck the tattoo to that. 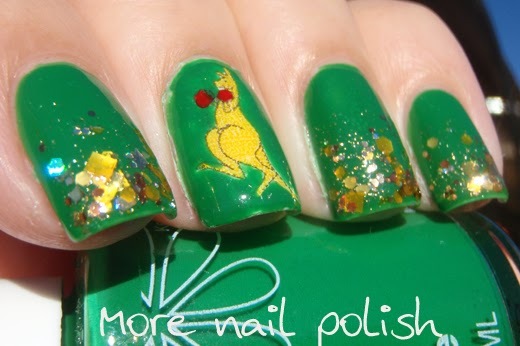 I then carefully painted around the kangaroo using a fine brush and Ulta3 Frog Prince. 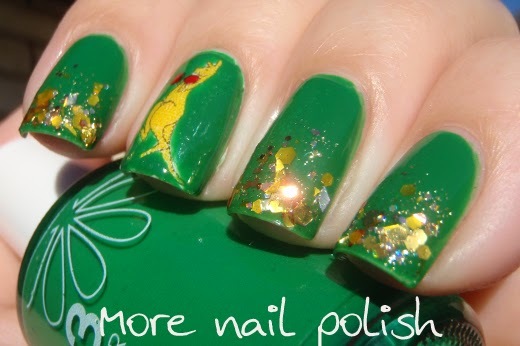 All my other nails feature Frog Prince and a glitter gradient tip with Lynnderella Topaz Optimism. 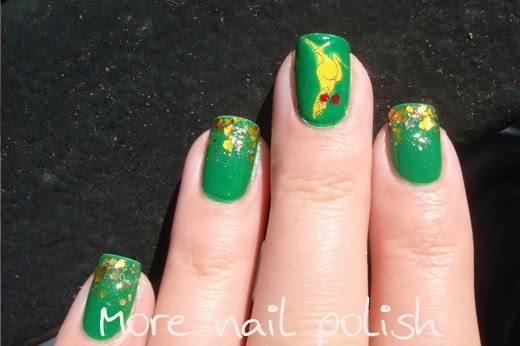 This is a great manicure! 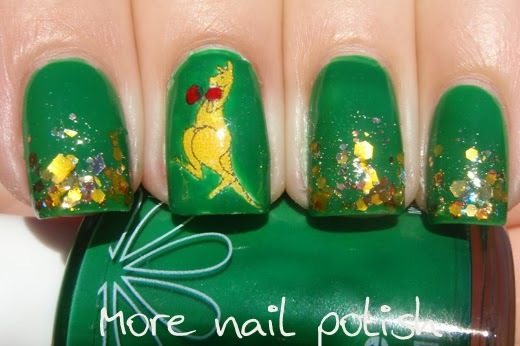 The kangaroo is awesome! I am really interested in what you said about tattoo paper? I have never heard of that before.